BhujiyoDungar is located on the outskirts of Bhuj. This hill primarily became popular because of the scenic view of the entire Bhuj that you get from this hill and also for the Bhujia Fort. 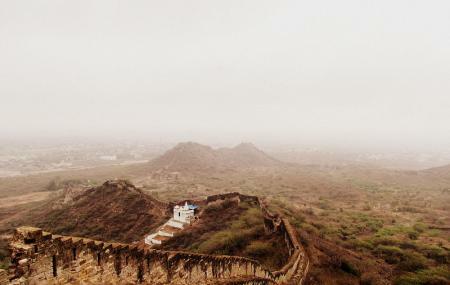 Though the fort is at ruin state at present, it once served as a shelter during battles. After independence, the fort was handed over to the Indian army to store ammunition. Within this fort, there a temple dedicated to Snake God – Naga Devata. You can visit the temple during Naga Panchami Day when the temple door is open for public visit. During this festival, a fair is held to appease Naga Devata. Bhujia Fort Gate: 8am – 7pm. How popular is Bhujia Hill? People normally club together Hiralakshmi Memorial Craft Park and Hill Garden while planning their visit to Bhujia Hill.